You can adjust the projection angle using the ball joint on the projection unit. Loosen the ball joint screw using the supplied hexagonal wrench. Make sure to support the projection unit while loosening the screw so that it does not move suddenly. Warning: Do not grip the ball joint with your fingers while loosening the screw or your fingers could get pinched. Tilt the projection unit to adjust the projection angle. 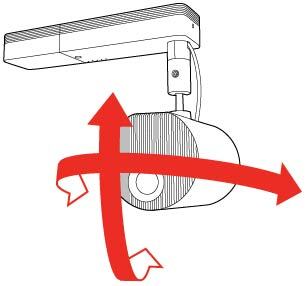 Make sure the cables do not tangle around the ball joint or you may damage the projector. When you finish, tighten the ball joint screw using the supplied hexagonal wrench. Make sure to support the projection unit so that it does not move. 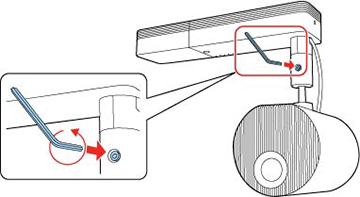 Do not force the ball joint to move after tightening the ball joint screw or you may damage the projector.